Cizzie was the only daughter of my great-grandmother, Old Nonnie. As much as Old Nonnie was a good cook and a maternal sort, Cizzie was not. She was, to my childish recollection, loud and fun. Her feet were mesmerizing as much for her gnarly red paint-tipped toenails as for her decorative mules. She’d have them be-jeweled, be-fruited, be-baubbled… be-anything’d. As soon as she’d come in the house, off would come whatever public garment she was sporting (I’m talking dress here, not coats and hats) and she’d tool around in her slip. And mules, of course. She was loud and fun and liked to laugh a lot. She was one of those adults you really didn’t think would mind if you didn’t mind your Ps and Qs. She smoked like a chimney and ate like a truck driver. Hence, the rule to never, never, ever sit across from her. She’d be telling a story, hands flying in punctuation the way those Italian hands do, chewing whatever morsel happened to have gotten past those ruby-slathered lips, half of it flying back out – with projectile precision across the table – never stopping whatever exclamation or guffaw she had going on. I think that’s why she was so thin, come to think of it. The majority of her calories laid waste to her tablemates and the linens. When it came time to sit at the table, there was a sort of dance between musical chairs and bumper cars to see 1) where Cizzie sat, 2) where your parents sat (close second in undesirable seating), and 3) where the boys were (no explanation necessary, ahem). Strategy planned, little kids there for the sacrificing, you sprang into action, elbows a flying to get that perfect sweet seat. And then you simmered down and said grace, trying desperately not to giggle at the poor fool who was staring into the maw that was Cizzie. My recollection of Cizzie makes me wonder what sort of legacy I will leave behind when I head off to my celestial adventures. She truly was a joyful spirit. Loud and happy and great with the kids … not one of those adults who shoo’d us away; in fact, I think she was kind of a kid herself. She never had any of her own, and never really (that I recall) picked up Old Nonnie’s domestic skills, even those in the kitchen. Except for her chicken, sausage, and pepperoncini dish. 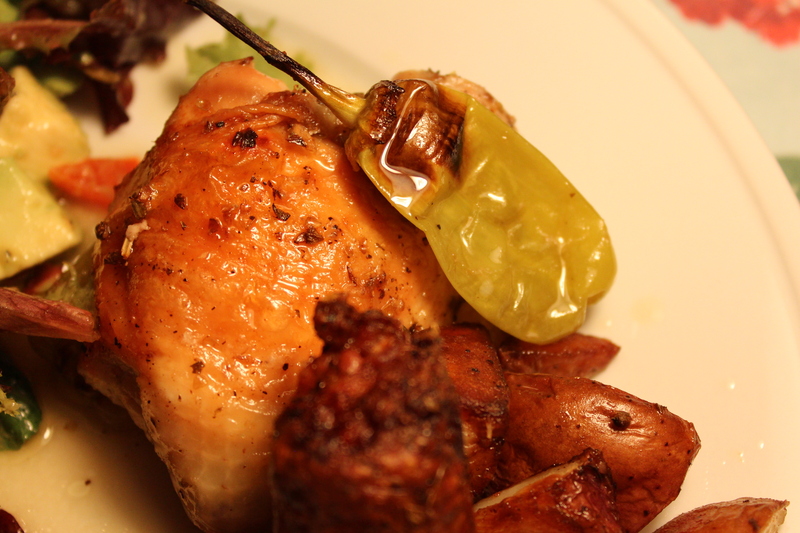 A lovely combination of roasted chicken goodness mingled with the twang and slight spice of the pepperoncini, rounded out with the fennel warmth of sausage, and then sent right over the top with the potatoes that sop up all that rich garlicy goodness. This recipe isn’t as much a pat recipe as it is a formula. You like white meat? Stick with that. You like dark? Thighs are delicious and a bargain! You want a combo? Go crazy. Just do not do boneless. And don’t do skinless either, peel it off when it gets to your plate (that’s what I do). The skin protects the meat from getting too dry and is a self-marinating apparatus for the dish. The amount of pepperoncini I use may curl your eyelashes but remember that they mellow while cooking. My boys – neither a tender tongue nor a fire-eater – love this dish. It’s economical and great for a crowd but also lovely enough to serve to special company. This is my taste-memory version of a Polvinale family classic. Start by peeling a head of garlic. Yes, an entire head. You will be rewarded with little nuggets of rich roasted garlic for your efforts. Toss these onto a foil-lined baking sheet. Wash and cube your potatoes into bite-sized pieces … about 1 inch. Toss onto the baking sheet. PSA: I don’t care if your produce bag says “triple washed.” Wash it anyway. It takes two minutes and gives me … I mean you … peace of mind. And as my mother would say, you don’t know where their [anonymous workers] hands have been anyway. 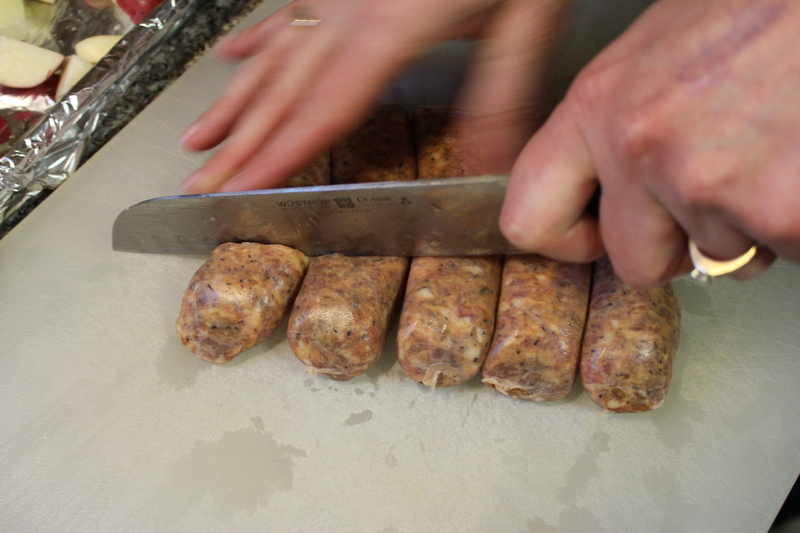 Cut each sausage link into three pieces. This will give you a two-bite piece when all is said and done. Big enough to get the flavor but not so small that it will dry out while cooking. You can do whole links but then folks may be a bit greedy with portions and fork-poking battles may ensue. Learn from my mistakes; that’s why I am here. Add whatever sized pieces you’ve decided on to the baking sheet. 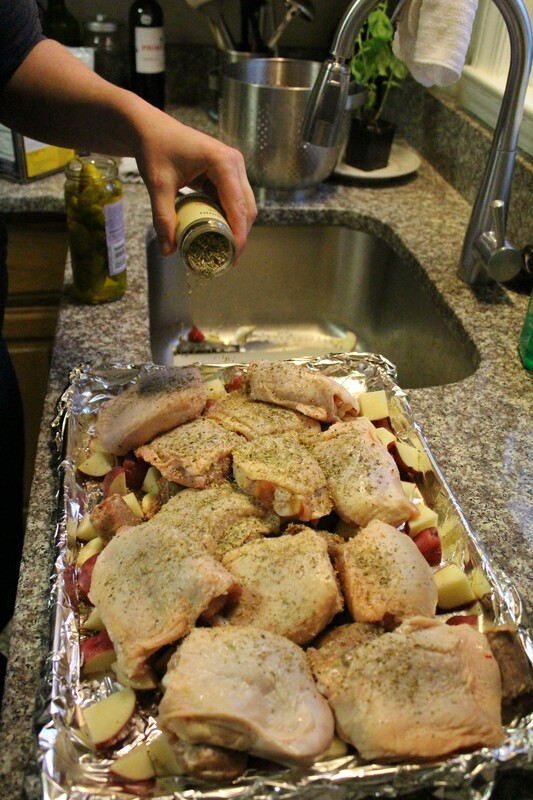 Put your chicken pieces onto the baking sheet and sprinkle liberally and thoroughly with oregano, salt and pepper. Please note that I went overboard on the chicken. This is 12 pieces and I could have gotten away with 8 … but I love leftovers. In fact, this may be better reheated. I’m on the fence with that one (but that’s what I’ve got lined up for today’s lunch). Add the pepperoncini and juice. I used a 16 oz. jar for this go-round. This is the part you’ll want to find your kids for; they love it (though mine were not available except the photographer and she was busy, natch). Drizzle liberally with olive oil then get your hands in there and get the flavors in all the nooks and crannies. 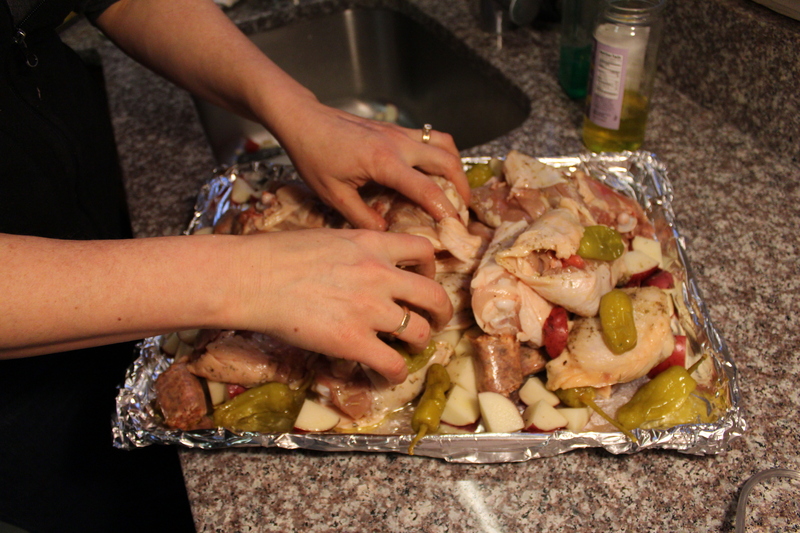 Then spread it all into an even layer, placing the chicken pieces skin side up. Otherwise, you’ll get …. rubbery skin. Ugh. I just shuddered…..
Fifty minutes in the oven (check for internal doneness… chicken should be 165; so sayeth the government’s food safety website) and viola! Don your face shield, toast Cizzie, and enjoy. Add a green salad and a glass of wine and dinner is served. Preheat your oven to 375 degrees F. Line your baking sheet with foil (or not … this just helps immensely with cleanup). Separate the cloves of garlic and peel, leaving whole. Place onto the baking sheet. 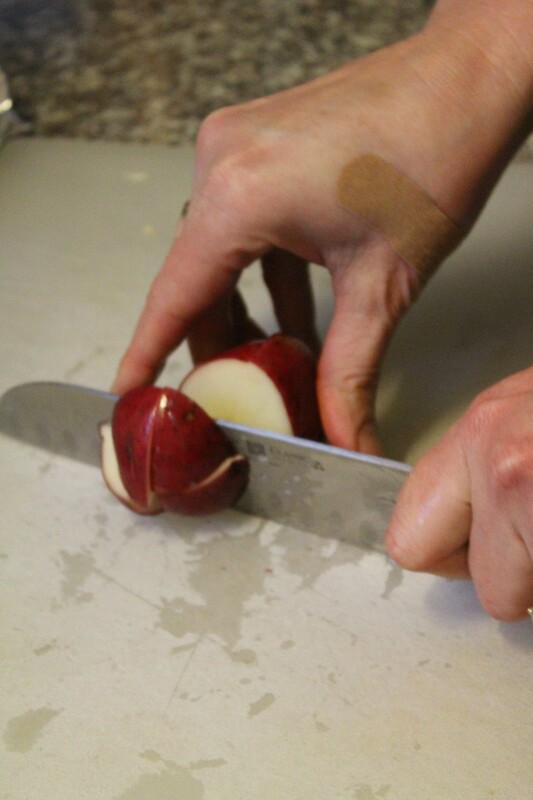 Wash and cut the potatoes into 1-inch dice (bite-sized pieces). Place onto the baking sheet with the garlic. Slice each sausage link into three equal pieces. Place onto the baking sheet with the other ingredients. Wash and pat dry the chicken pieces. Place onto the baking sheet as well. Pour the pepperonci and juice over the chicken. Drizzle the olive oil over the ingredients in the pan. Sprinkle with the oregano, salt and pepper. Toss to combine and then lay the ingredients out in as even a layer as possible. Make sure the chicken pieces are skin-side up. Bake in the oven for 50 minutes or until you get an internal chicken temperature of 165. NOTE: The quantities of the ingredients can be tweaked to your liking (and number of folks you’re feeding. If you need to stretch the dish, add more potatoes, chicken and/or sausage. Toss in a bit more olive oil and seasoning and be on with your bad self. 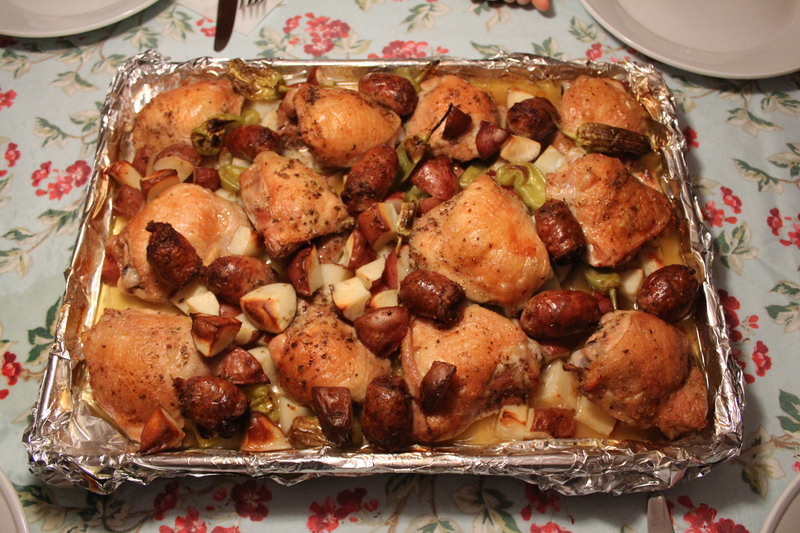 This entry was posted in Main Dish, Poultry and tagged chicken thighs, Dinner, Dinner Party, famly dinner, feed a crowd, garlic, Italian sausage, one pot dish, one pot meal, pepperoncini, potatoes, roasted chicken, roasted sausages, sausage, Sunday dinner, tradition. Bookmark the permalink.